Matthew and Agnes are requesting your attendance, as they begin their life together. They will say "I Do" at the gorgeous RIU Palace Pacific resort in Puerto Vallarta, Mexico on September 14, 2019. To pay a deposit, and guarantee your spot at the wedding, please contact Jarod's Journeys through this link, or by calling 206.852.4558 or through the contact form at the bottom of this page. For those that would like to make payments, several payment options are available at no additional cost to you (excluding airfare). The Hotel Riu Palace Pacifico (24hour All Inclusive) is located in Nuevo Vallarta, Mexico, and is undoubtedly our most luxurious hotel in the area. The high quality service and professionalism of its staff make this hotel the perfect place to spend your vacation. If you want to escape from the hustle and bustle of the city and leave the stress of everyday life, this Palace offers you the best facilities to cater to your every need. You'll find a fresh water swimming pool, jacuzzi, solarium-terrace, gym, sauna and spa with a range of different treatments and massages. Thanks to the All Inclusive system you can enjoy Mexican cuisine at its best. It includes a wide variety of recipes and is recognized for its distinctive and sophisticated flavors which incorporate many spices. It is a combination of gastronomic traditions, including Mesoamerican and European ones, as well as many others, which is why the buffet restaurant and the different themed restaurants of the hotel offer the best menus and made to order dishes. You will also find numerous activities and sports to enjoy during your stay. You can go diving, play volleyball, do gymnastics, windsurfing, catamaran, kayaking, bodyboarding, golf and many other water sports at the beach. At night you mustn't miss the different shows and live music organized for you by our entertainers. If you want to go dancing we invite you to the "Pacha" club where our DJs play the best beats. Your children will have a ball with other children in the Riu Land program where crafts and sports are just some of the leisure activities organized by our entertainers. Surrounded by the beautiful Banderas Bay and protected by the impressive Sierra Madre you will find Nueva Vallarta, one of the most popular tourist destinations in Mexico. With excellent beaches and water sports, this city gives you the opportunity to get closer to nature, at its most unique. If you want to go on excursions and discover the surroundings, we recommend you to make a stop at Banderas Bay to see the release of sea turtles, swim with dolphins, observe blue whales, go horse riding in the Sierra Madre, and for the more adventurous we suggest bungee jumping. In the beach area, you will find many restaurants, bars, cafes, shops and businesses where you can buy souvenirs. 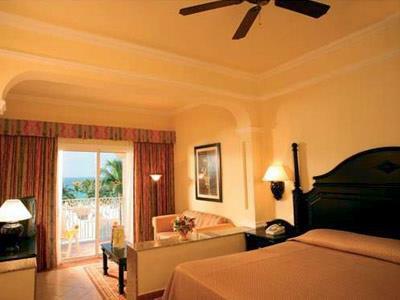 These rooms at the Hotel Riu Palace Pacifico are designed for you to enjoy your holiday in Mexico to the utmost. These Oceanview suites are equipped with either 2 double beds or one king bed, a sofa in the lounge area, a hydromassage bathtub, WiFi, satellite TV, air conditioning, a mini bar and beverage dispenser and a coffee maker. Plus, from the balcony or terrace, you'll be able to enjoy incredible views of the Pacific Ocean. If you need help booking airfare, please let Jarod know. Airfare will need to be paid for in full, however Jarod's Journeys has access to several consolidators and will find you the best available fare! No gift is needed! Traveling to Mexico with us to celebrate our special day is gift enough! If you are ready to book, reach out to Jarod's Journeys. You can click here to go directly to a booking link, or you can email Jarod in the contact section below. Please remember that the dates for travel are September 12-15th and please let Jarod know that you are booking for Agnes and Matthews wedding!